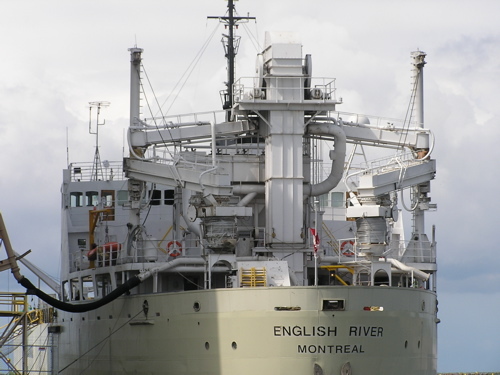 Unlike most ships in the sixth boro, smaller ships–both lakers and salties on the Great Lakes–sport stern anchors. in the same location on English River. Where do you imagine the other complicated stern gear leads to? 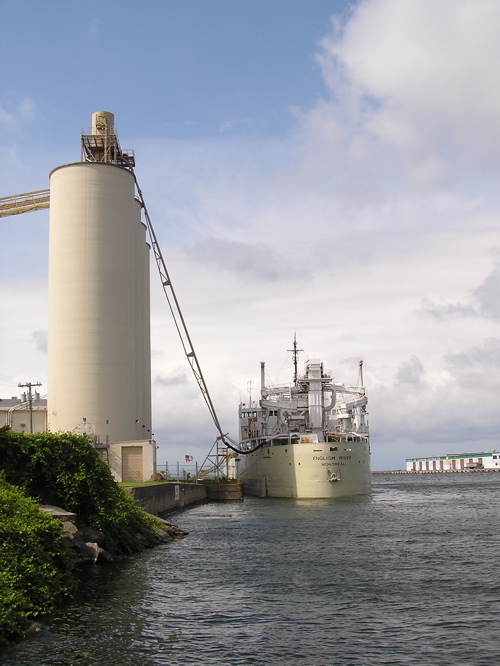 Up the silo, as she offloads in Oswego. So do stern anchors pose additional challenges, given proximity to the prop? 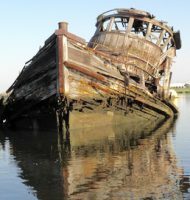 Here’s a final stern anchor shot of a “light” salty taken and posted here in mid-July. Last week Tuesday early evening I spotted Marlene Green traveling upbound through the 1000 Islands with a new load of wind towers and turbines for–Duluth? Can anyone confirm that these towers ship from Spain? I intended to call this post “tailhooks” until I remembered some convention almost two decades ago that leads me to make the association with “scandal” if I hear “tailhook,” even though it denotes just a device designed to assist in carrier landings. See this link for interesting laker and salty fotos. I’m having a delightful time catching up with you and your images. Yes, marvelous images of varnish. I love varnish especially lake boat varnish. Great sterns too. 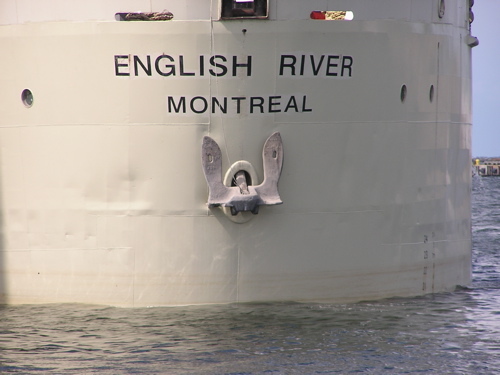 I had not known both kinds of boats had stern anchors. I will have to read Boatnerd more often. 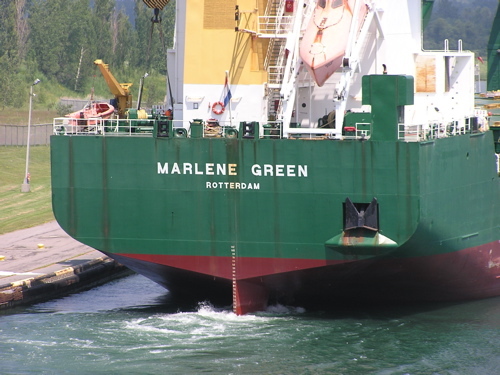 Last Tuesday I was at Eisenhower Lock and shot photos of Marlene Green locking through, so you and I were not too far apart and caught her on the same voyage. I’m working on a post for Self-Absorbed Boomer about the afternoon I spent at the lock, so check in a couple of days. 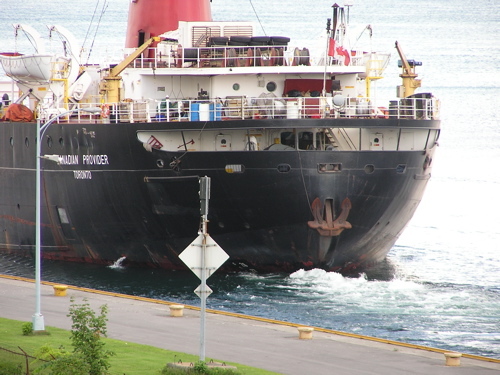 It will also include photos of the classic (wheelhouse forward) lakers Maritime Trader and Ojibway, which locked through earlier. The chalk board at the Eisenhower Lock listed Marlene’s cargo as “windmill” (“How appropriate,” I thought, “for a Dutch ship”) and her destination as “Michigan”. It didn’t say where her voyage started.